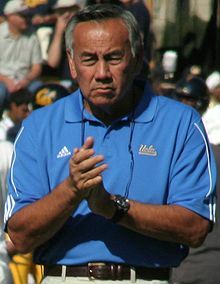 Norm Chow is the offensive coordinator for the UCLA Bruins football team. He was born on May 3, 1946, in Honolulu, Hawaii, U.S.A. Chow has also been offensive coordinator for the NFL's Tennessee Titans, the University of Southern California, North Carolina State University, and Brigham Young University. Chow is considered one of the top offensive coaches in collegiate football history. "Chow won the 2002 Broyles Award as the nation's top collegiate assistant coach. He also was named the 2002 NCAA Division I-A Offensive Coordinator of the Year by American Football Monthly and was named the National Assistant Coach of the Year in 1999 by the American Football Foundation. He is known for developing quarterbacks such as Jim McMahon, Steve Young, Ty Detmer, Philip Rivers, Carson Palmer, and Matt Leinart." He is credited with helping Vince Young's transition from college to pro football. Chow attended high school in Hawaii and then attended the University of Utah. He played football there as an offensive guard, being named to the All-WAC first team and gaining All-America honorable mention honors in his senior season. He earned a bachelor's degree in physical education and a master's degree in special education from the U of U, and then a Ph.D. in educational psychology from BYU. Chow played for the Saskatchewan Roughriders of the Canadian Football League, until an injury ended his pro-ball career. He was selected for Utah's All-Century Team. Chow was offensive coordinator at BYU from 1982 through 1999. The Cougars were #1 in the U.S. in 1984 as a non-BCS school. At various times during his tenure at BYU he was the Cougars' assistant head coach, offensive coordinator, co-offensive coordinator, quarterbacks coach, receivers coach, recruiting coordinator and graduate assistant (1973 and 1974). The Cougars posted a 244-91-3 record during his time in Provo, appeared in 22 bowls and saw 21 offensive players earn All-America honors. In 12 of his 18 years as offensive coordinator at BYU, Chow led the offense to a place in the NCAA's top 10 in total offense. He then left for North Carolina State for a short time before joining USC's coaching team. Chow helped lead the Trojans to the 2003 Associated Press (sportswriters' poll) National Championship, (their first national title since 1978), and the 2004 BCS National Championship. From 2005 to 2007 Chow was in the NFL, coaching the Tennessee Titans. In 2006, FOX's Terry Bradshaw named Chow the NFL's Top Assistant Coach. Chow was hired by UCLA in 2008. Chow has been interviewed for several head coaching positions both for colleges and the NFL. While coaching at the collegiate level, Chow has made some astounding achievements, including three national titles (BYU, 1984; USC 2003, 2004), tutoring three Heisman Trophy winners, participating in 27 bowl games, and three times being named Assistant Coach of the Year. Chow has mentored six first round NFL draft picks and one Pro Football Hall of Fame member. In 2004, Chow served as Grand Marshal of the annual Chinese New Year Golden Dragon Parade in Chinatown, Los Angeles. On May 3, 2009, Chow was honored by the Los Angeles Chinese Historical Society of Southern California in "Celebrating Chinese Americans in Sports." Chow and his wife, Diane, have been married for forty years and they have four children, three sons and a daughter: Carter, Maile, Cameron and Chandler. Carter serves as his father's agent. They have two grandchildren. This page was last edited on 17 September 2010, at 07:40.